If that household spring cleaning you just completed requires a technology equipment purging, you’re in luck. 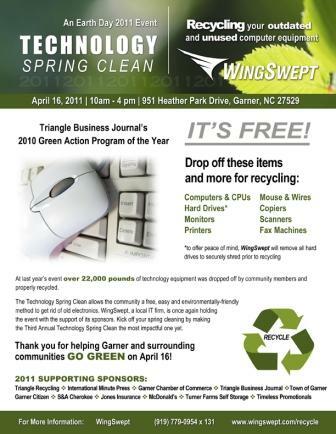 Local IT consulting company Wingswept is holding its third annual Technology Spring Clean on Saturday, April 16 from 10 a.m. to 4 p.m. at 951 Heather Park Drive in Garner. Professionals will be on hand to take your old computers, wires, printers, hard drives, scanners, fax machines and other equipment. Concerned about security? Don’t fear: WingSwept will shred hard drives prior to recycling to protect your personal data. More than 27,000 lbs of equipment was properly recycled and diverted from landfills from the past two Technology Spring Clean, according to WingSwept. To show our support for this free community event, Turner Farms Self Storage is a sponsor. For more information, 919-779-0954 x 13, or visit Wingswept’s website.